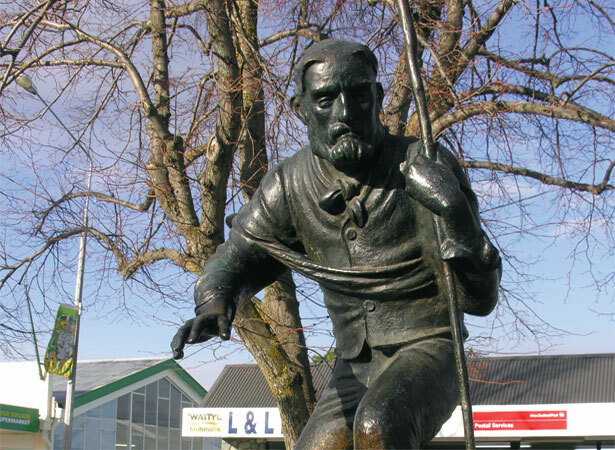 In March 1855 shepherds searching for 1000 missing sheep in the upper reaches of the Waitaki Valley apprehended suspected rustler James Mackenzie, one of New Zealand’s first and most enduring folk heroes. Caught red-handed, Mackenzie denied the theft, claiming he had been hired to drive the sheep to Otago. After escaping his captors, he walked 160 km to Lyttelton, where he was recaptured on 15 March. A Supreme Court found Mackenzie guilty, sentencing him to five years’ hard labour. Mackenzie escaped from his road gang twice, remaining at large for a few days each time. In September 1855 a new magistrate reinvestigated his case and found flaws in the police inquiry and trial. Pardoned in January 1856, Mackenzie probably returned to Australia, but details of his later life are scarce. The exploits of Mackenzie and his loyal dog ‘Friday’ left an indelible mark on the South Island high country. Canny pastoralists quickly realised the significance of the pass where he was found with the stolen sheep, and the open country beyond. This region was subsequently dubbed the Mackenzie Country. We have 3 biographies, 5 articles, related to Legendary sheep rustler James Mackenzie caught.